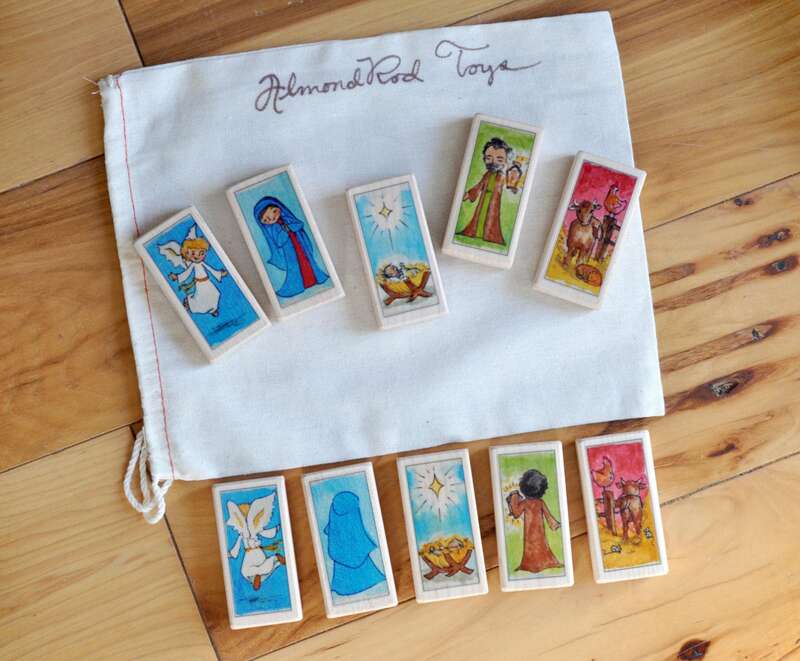 This Nativity set includes 5 blocks with adorable artwork on both the front and back! 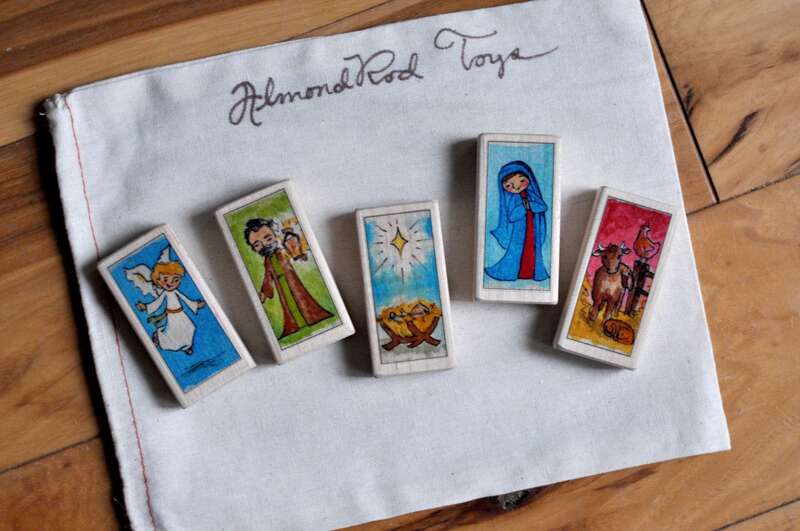 There is an angel, Mary, Joseph, animals in the stable, and Jesus in the manger. 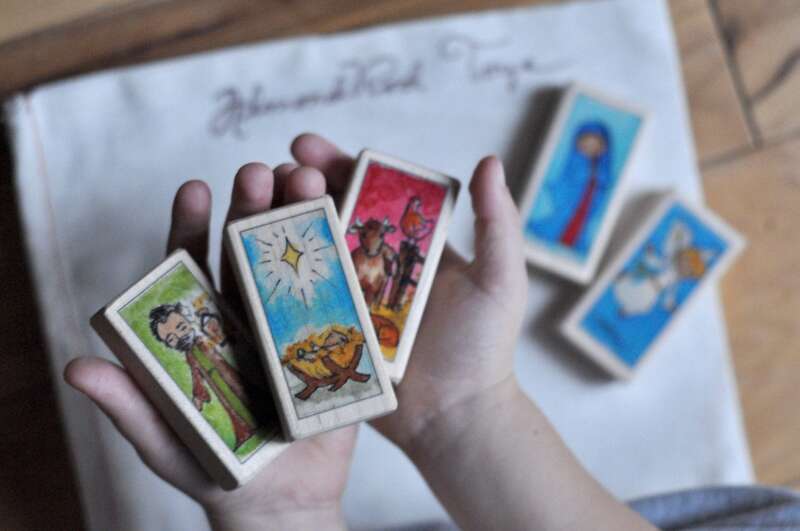 I designed these nativity blocks for my own 5 kiddos - they are meant to be easy to clean, hard to break, beautiful, educational, inspirational and versatile (for tots, little kids, or big kids). Best of all they give the opportunity for prayerful play. These blocks are just the right size for little hands. They can be used for imaginative play, building, stacking or collecting. I have a print of my original watercolor art on the front and the back of each block. They are made from beautiful precision cut maple blocks that are approximately 2 3/4 inches x 1 1/2 inches x 3/4 inches. They are professionally printed on heavy duty weatherproof polyester paper - the same kind that bumper stickers are made of, which gives them as much baby proof durability as possible. :) They can be easily cleaned with a damp cloth. They come from a smoke-free (and gluten-free) home and are prayerfully designed by a Catholic mom of 5. Check out the deluxe 15 piece set with shepherds and kings! Orders are mailed in 2 weeks or less through USPS. If you have a special date that you need them by please let me know and I can probably rush your order. I very well may be able to combine shipping and save you money - especially if you are shipping to the US and your shipping total is greater than $13. If you are ordering 20 blocks or less, your shipping can be manually adjusted to $7. Please just send me a note to make sure I flag it to give you a shipping refund. International orders are usually $20-40 dollars and combining shipping will save you a ton. You can get a shipping estimate by contacting me before your order. Perfect size for little hands! My nephews, ages 3 and 2, enjoyed them! No more ugly nativity sets or worries about broken figures! Great quality, perfect size & colors for little hands! Repeat customer. 100% pleased with thus transaction. Thank you.